I am a CTC national standard Cycle Trainer and accredited Bikeability provider. I also work in schools for Hertfordshire County Council. I have been providing cycle training within the area now since 2006, with many beginners now cycling as a result. Of course I hold a current first aid certificate and have been CRB checked to work with children. Dates and times within the week to be agreed at booking time. To be arranged during the week beginning 2nd August. I have been cycling out on the roads since I was a small child. 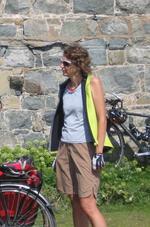 I have travelled extensively around the UK and France on my bike. Often taking my camping gear along too. I am a Registered Ride Leader with Herts CTC, see www.stevenagectc.org.uk for local ride details, and of course taught my own children to cycle and have taught many others since then. I reserve the right to not take out anyone with an unsafe bicycle or who is not able to follow instructions. Unless the weather is dangerous (ice/snow/strong wind/severe rain) I will be prepared to teach. I expect to be given reasonable notice of cancellation. I reserve the right to impose a charge if notice period is unreasonable. For example cancelling a group course within one week. Cancelling an individual lesson on the day.